Crochet necklace patterns are a unique way to really put your own personal spin on your personal style. Necklaces are typically made with chains and metal or beads, but you can change the game by using yarn in varying weights to crochet necklaces for any occasion and for any style! Crochet necklace patterns, much like crochet bracelets, are so fast to work up and usually aren’t too intense or complicated. With your yarn, you can make smaller, subtle necklaces or go bold and make large statement pieces. 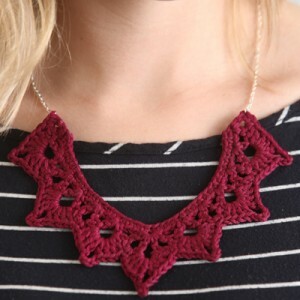 No matter what type of crochet necklace you’re after, we’ve got it in this collection! Instructions are provided for every step of the way, including for how to attach it to your chain, as needed. 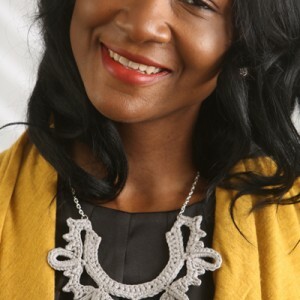 Seize the day and give crochet necklaces a try! With only a ball chain and a crochet flower you can make a cute necklace very easily. 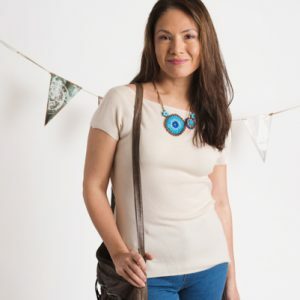 Vary with the pattern, the yarn and the colors to make a necklace that matches your style. 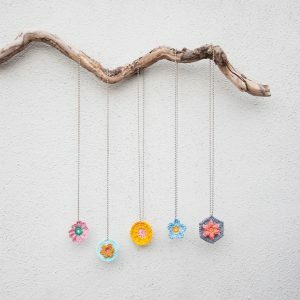 I’ve designed five different flower necklaces so that you can choose the one you like best: Dahlia, Waterlily, Sunflower, Forget-me-not and Papaver. 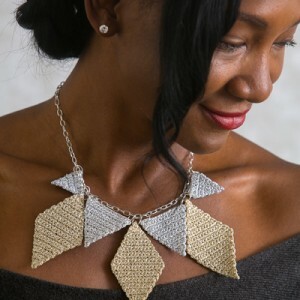 Geometric statement necklaces are all the rage, and this metallic gold and silver diamond necklace is no different! This easy pattern is comprised of seven total diamonds and triangles that are then attached to a jewelry chain of your choice for a one-of-a-kind statement piece. The Corona Necklace is a stylish U-shaped necklace that pairs effortlessly with any top or dress. Corona can be made with scrap yarn and is quick and easy to make. Mini-granny square-like motifs quickly work up in fun variegated colors to compliment a unique agate pendant for this one-of-a-kind necklace. This statement piece will brighten your summer! This gorgeous join-as-you-go design pairs an easy construction with bold textured circles to make the perfect statement piece. Channel your inner mermaid with this beach-ready accessory that’s fit for the season. This special celtic knot, symbolizing motherhood with its two intertwined hearts, will make a perfect gift for your mom this Mother’s Day. Simply crochet four cords and weave them according to the diagram included. A gold chain and dainty beads add a classy finishing touch. Using simple crochet stitches and luxurious metallic yarn, create a wrap for a beautiful cabochon that hangs from a delicate necklace. This necklace makes a great statement piece for a fancy night out. 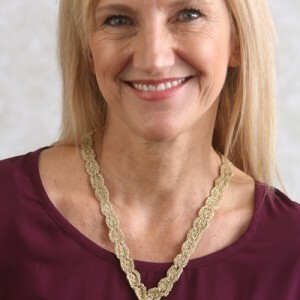 The Reina Necklace is a versatile statement necklace that can be worn over a simple t-shirt, a dressy blouse or a summer dress. It’s also a wonderful project for using up scrap yarn.